I began my final morning in Minnesota by having breakfast with two high school friends. Although a little bleary eyed, we had a great time dissecting everything that happened the previous night at our 20-year reunion. After breakfast we all checked out of the hotel and I had about five hours to kill before I needed to be at the airport. Luckily for me there are many pleasant ways to spend a beautiful summer day in Minneapolis. My biggest problem was trying to limit myself. Not having been in Minneapolis for about three years, I had some new architecture to check up on. I took a quick swing through the warehouse district which has been developing for years but is now starting to really feel like a full-time neighborhood. 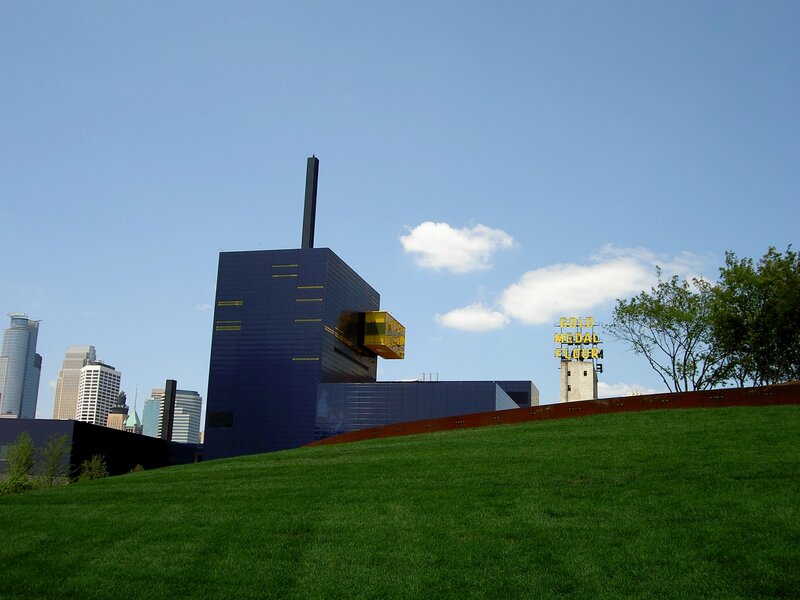 One of the new anchors on the east end of the district is the new Guthrie Theater building. Perched right on the Mississippi River and designed by Jean Nouvel, the deep blue building nicely complements its 19th century industrial neighbors on both sides of the river. After the failed festival shopping centers of the 1980s along the north side of the river (Riverplace and St. Anthony Main) it is nice to see this kind of draw down on the river. I think the new Guthrie serves a similar function (and has some of the same design edge) as Herzog & de Meuron’s Tate Modern in London. In addition to the bike and walking paths that run in front of the theater along the river, there is a brand new park right next door that strikes the right balance of greenspace and hardscape. At the center of Gold Medal Park (after the flour brand of the same name) is a giant grassy mound that has a spiral path edged in steel that winds up to the top where one gets a view of the neighborhood and the river. The park is already a pleasant place to be, I can only imagine how nice it will be when the trees mature. Although I would have liked to have taken a more extensive tour downtown to see what was new, I didn’t really have the time. But I did manage to take a drive by the new Pelli-designed Minneapolis Public Library. From what I could see it is a great building. Since I had another destination in mind I skipped a visit the Walker Art Center. Having seen the new Herzog & de Meuron addition three years ago I decided not to make a repeat visit. This decision also meant I missed out on the best free date in town, the Minneapolis Sculpture Garden and the best ice cream in the entire Midwest at Sebastian Joe’s. Having happily gorged myself at Dairy Queen earlier in the weekend, I didn’t feel too deprived—although DQ and Sebastian Joes have nothing in common other than being purveyors of cool, creamy, sweet treats. My main destination was the Minneapolis Institute of Arts. Living in DC and having access to the National Gallery of Art, the Hirshhorn, the Corcoran, the Phillips, the Kreeger, and a host of other art venues, I have a lot of options for viewing fine art. Even against that background I still find the MIA to be one of the most satisfying art museums in the country. Not only does it have a fine collection, but the museum space itself is a pleasure. I was particularly interested to see A Mirror of Nature: Nordic Landscape Painting, 1840-1910. It was fascinating to see these works that would otherwise not be seen in North America or, in many cases, even in Europe outside of Scandinavia. There were some real gems including the Munch painting that heads up my 8/1 posting below. It was also great to see some of my old favorites in the permanent collection that I have seen off and on for the last 30 years. It was reluctantly that I headed off to MSP to get my flight back to Washington. But even that experience was pleasant. Once you get through security MSP has a lot to offer in the way of food and shopping (Yes, I went to the Dairy Queen again). I was one of the lucky ones whose Northwest Flight did not get cancelled. After this quick, recent trip to Minnesota, it was awfully strange to see it suddenly the center of media attention. Minnesota is a prosperous state. Minneapolis is a prosperous city. And Minnesotans do the right thing. We understand—or at least used to—the benefits of responsibility and of delayed gratification (all those Lutherans and Catholics). Our industries have been historically and notably philanthropic and our outlook is relentlessly pragmatic. So why on earth did that bridge fall into the river? What priorities have so captured the hearts and minds of the state that something like that can happen? Which tax cuts could have fixed that bridge?